The First Persons Bible Study SAMPLE PACKET with TEACHING POWERPOINTS includes two First Persons Student Books, one First Persons Leader's Guide, 184 Teaching PowerPoint frames on one CD Rom, and a printed 32-page First Persons PowerPoint Guide.-- all of the First Persons resources in one packet. The Teaching PowerPoint frames are Holy Land pictures, paintings, charts, maps and other images pertinant to the stories in the popular First Persons study and do not require you to have PowerPoint software. The PowerPoints and the textual guide adds another level of teaching material to that which has been so successful in the First Persons Student Books and Leader's Guide. 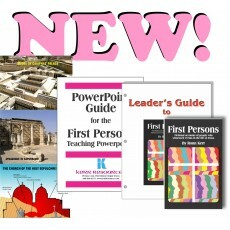 The First Persons Teaching PowerPoints is a brand new addition to Kerr Resources' most popular Bible study ever. There are 184 frames of Holy Land pictures, maps, charts, paintings and other images that correspond to the stories in the First Persons Student Book and add substantially to the already thorough First Persons Leader's Guide. The First Persons PowerPoint Guide has pictures of every slide as well as a brief teaching description which, along with the extensive Biblical background material in the First Persons Leader's Guide, makes teaching this course a snap.